Every once in while I stumble across a cool & unusual kit going for a bargain on ebay. 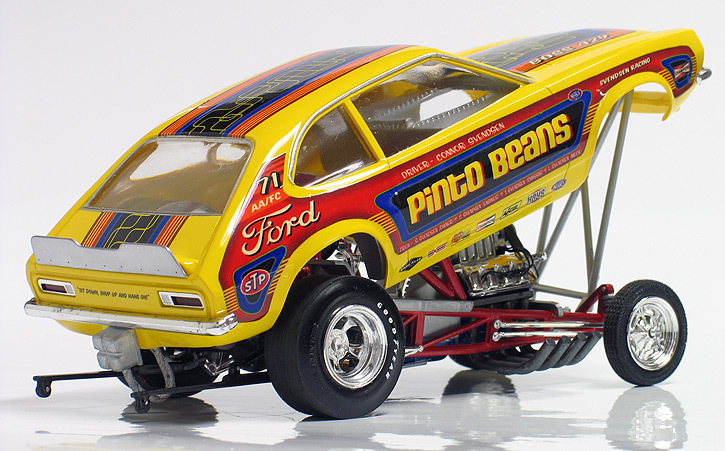 Such was the case with this AMT Crazy Horse '71 Ford Pinto funny car kit. It was half-built and had some parts were missing, but I thought I could save it. I made a bid and won the kit. 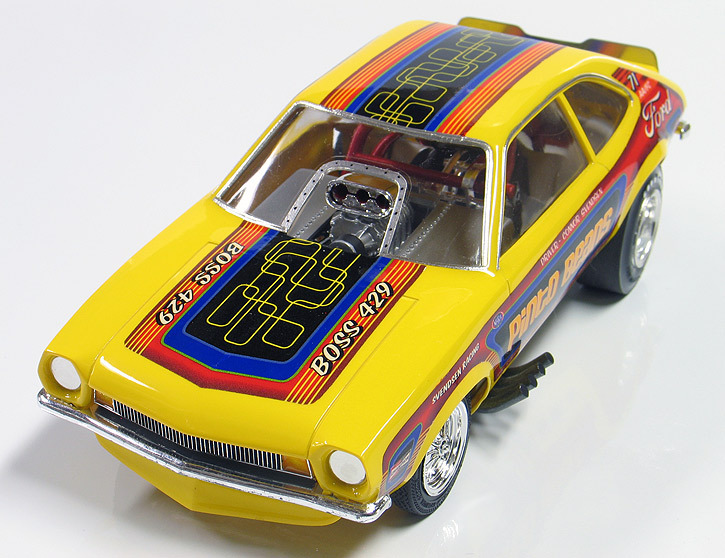 During the early '70's, AMT made a series of fictional short wheel-base funny car kits using the popular econobox body shells of the time. 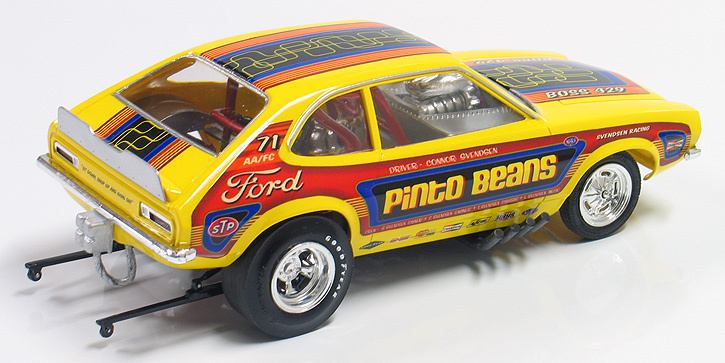 There was this Pinto, a Gremlin and Vega wagon bodied kits. They all shared the same chassis, but had different engines. 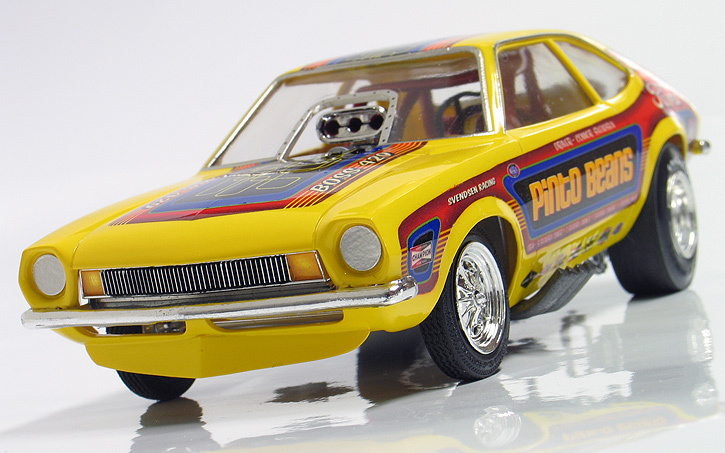 While the Pinto and Gremiln have accurate stock bodies, the Vega's body is modified to fit the chassis. I have the Vega kit in my stash also, but haven't scored the Gremlin yet. The picture on the ebay listing was fussy, so it was a bit of a crap shoot as to what condition the kit would be when I got it. Luckily, when it arrived I was happy to see that most of the important stuff for the body and chassis were there and many parts were still on the trees. The only major parts missing was the motor, wheels & tires. The body had been painted with a thin coat candy apple red paint. I soaked it Castrol Super Clean over night and stripped the paint. The paint came off easily and revealed a nice pristine body. 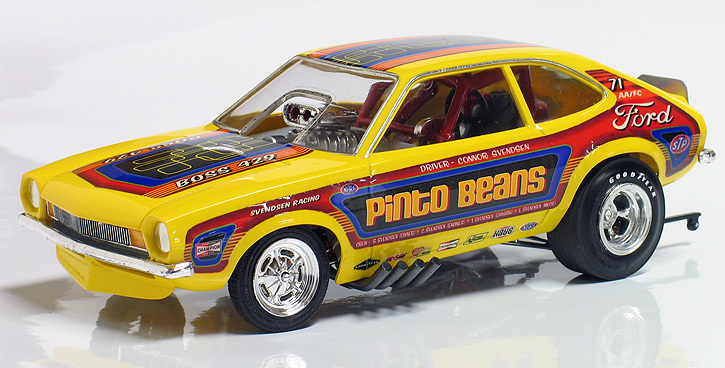 The Pinto kit comes with a stock appearing body with all the trim molded on. Because I was going to build this as a funny car, I sanded off all the trim and door handles and then bondo'd over the cowl vents and gas filler. I also enlarged the rear wheel openings a little for more clearance around the drag slicks. Lastly, I cleaned up a few sink marks at the same time. 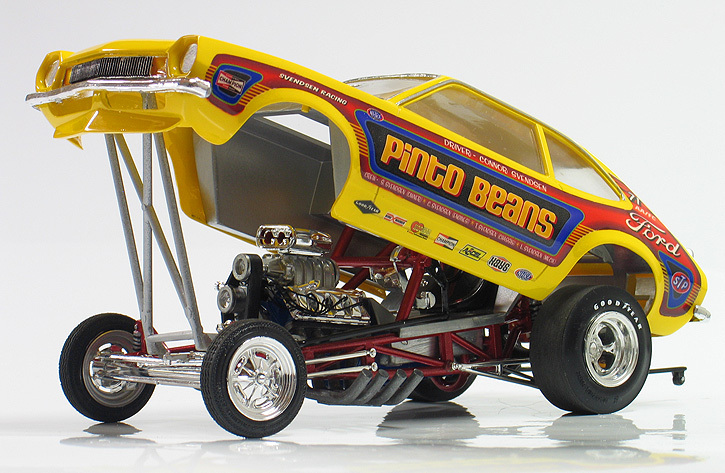 The AMT Pinto kit comes with a front spoiler which I molded to the body. The kit also comes with a roof spoiler, which I didn't care for. I decided to make a new rear spoiler for the rear deck. 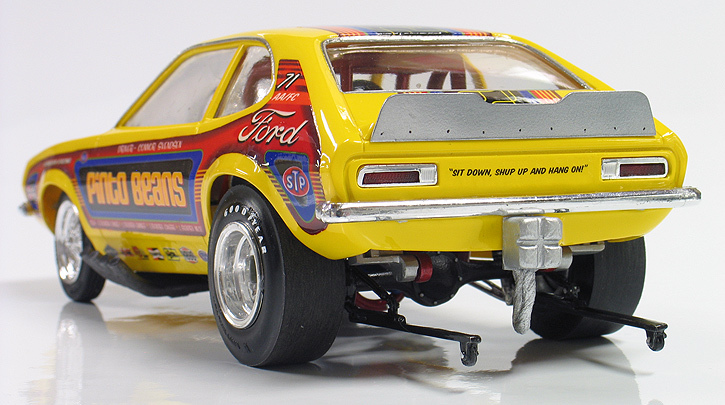 The rear spoiler is a combination of a trunk spoiler from the AMT/MK '69 Camaro funny car kit and a thin extension plate which I made from sheet styrene. The headlight covers were made by punching out a couple of disc from a sheet of BareMetal foil using a hole punch. The really fun part of building this kit for me was creating my own decals. Since this wasn't going to be a replica of a real car I wanted to design some panel style '70's era graphics for my model. First, I made paper templates of the panel shapes that I wanted. Next, the templates were scanned into my computer. I then came up with the name "Pinto Beans" and created all the artwork on my Mac using Illustrator CS3 software. Next, the art was printed on white inkjet decal paper from the BareMetal foil company. After the ink dried it was sprayed with a two part urethane clear to waterproof the art and complete the decal process. 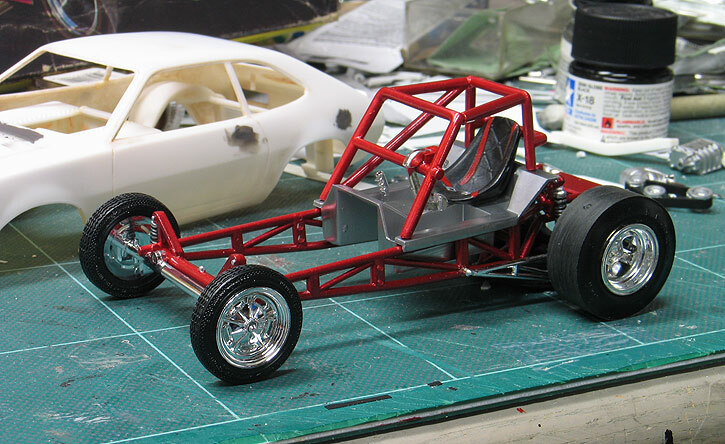 For the paint job I sprayed the body with Tamiya bright yellow and the chassis was sprayed with Tamiya metallic red. After applying my custom made decals, the body was sprayed with another coat of urethane clear. The metal interior tub was painted with Testor's stainless steel and buffed to a high sheen. 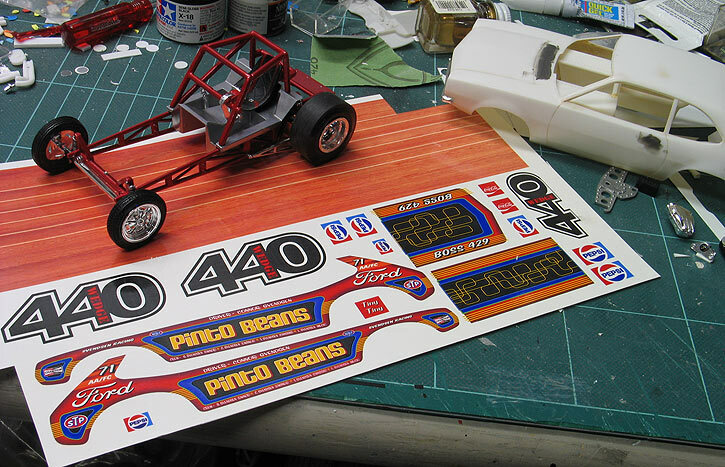 The front windshield included in the Pinto kit has a huge cut out for a big clear scoop which surrounds the blower. I thought whole setup looked too cartoonish, so I used the stock windshield and cut out a new smaller opening. I then added a new aluminum trim piece around the opening. I replaced the missing engine with a blown Boss 429 motor taken from a MPC Multi-Maverick kit. I really hate doing engine wiring, but made a humble attempt at adding some ignition wiring. 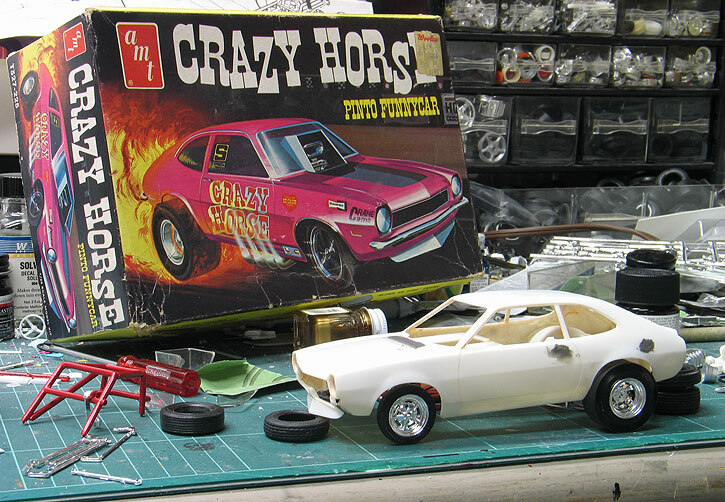 The Halibrand front wheels and tires came from the same Multi-Maverick kit as well. 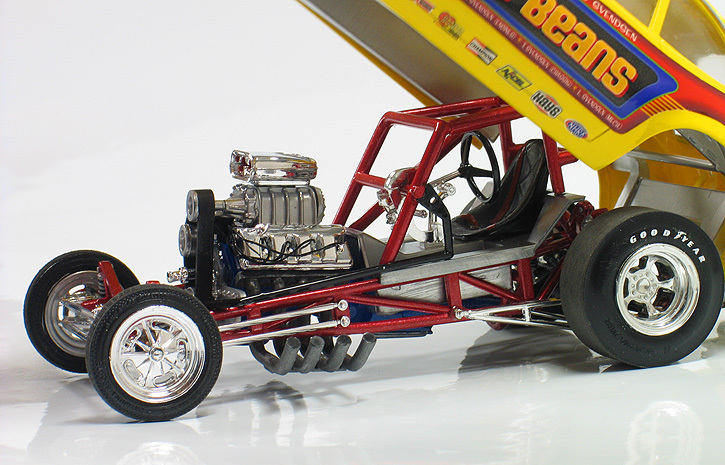 The rear wheels came from a MPC '74 Dodge van kit and the slicks came from my parts box. 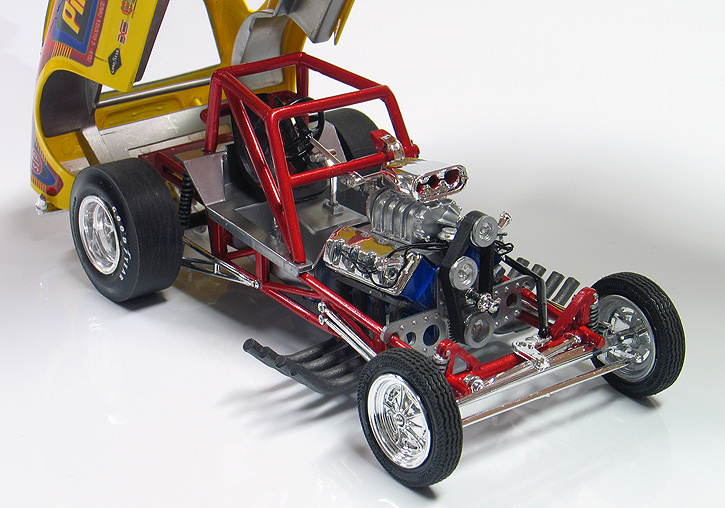 The rest of the chassis was built pretty much right out of the box from the Pinto kit. The final detail included using a parachute from my parts box and adding the chute lines.